If you want to see a larger version of the banner image try this, and below is the video clip promised. Sorry for the poor quality, I’m working on borrowing a better video recorder (I’ll post an update if I manage to get one). There are a couple of animations that happen too fast for the camera. One is a side-to-side sweep that looks similar to a Cylon Eye or the front of Kitt, the car from Knight Rider. The other effect that is poorly represented in the video is a chase function that outlines the rectangle of the display. These both look great to the eye, and fortunately the scrolling text comes out pretty well in the video. 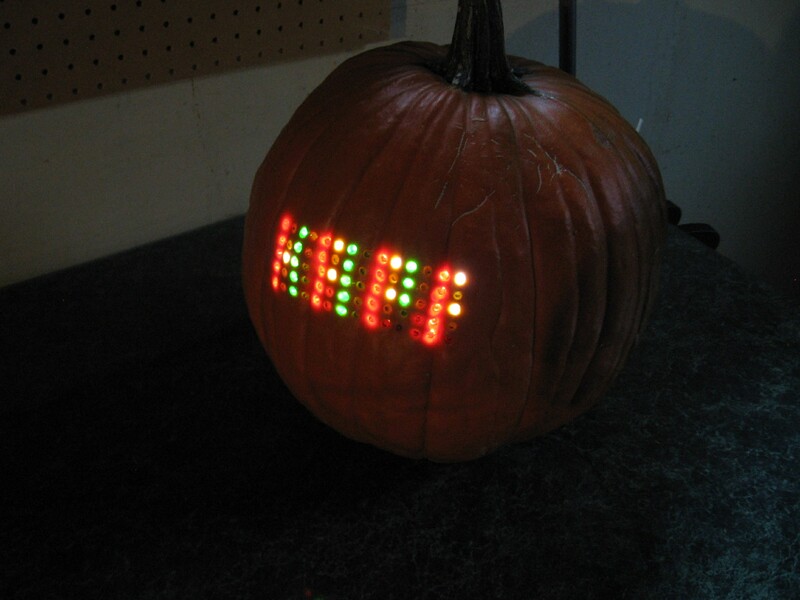 I’m going to take you down the rabbit hole of LED Matrix design but before that let’s look at what it took to make this Jack-‘o-lantern. If it turns out to be more than you can chew, we’ve got a beginners tutorial to help you get started with these microcontrollers. Before we talk about how to design the circuit, let’s take a look and the build process. I decided from the start to use different colored LEDs. For reasons that I’ll discuss in-depth in the design section of this tutorial I needed to drive the LEDs at about 10 mA each. 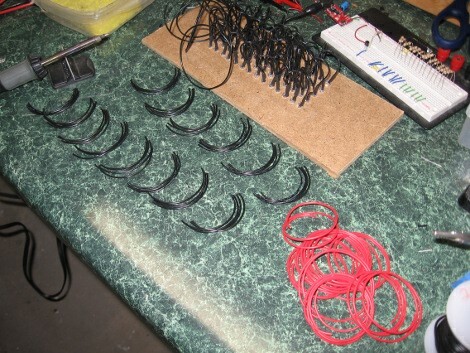 I calculated my resistors and then measured each to make sure I was close to my target. This is just fine for blue. 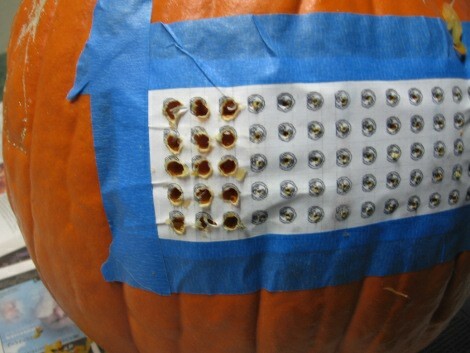 I wanted a way to hold the LEDs while I’m soldering, and I needed a template for drilling the pumpkin. Here I’m using that template made from my Eagle board layout to make an assembly jig using some hardboard. This turned out to be a rather poor choice of material because it started to come apart on the underside, but it worked. 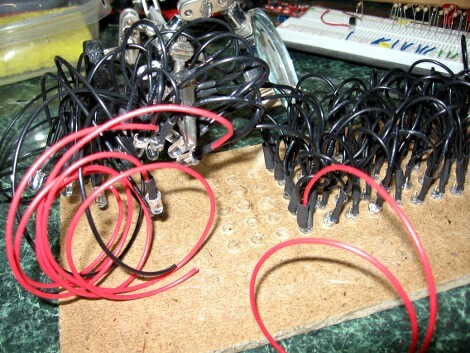 I need to solder all of the cathodes in the same row together. I cut small pieces of wire (13 for each row) plus a longer wire to connect to the driver board. Above I’m soldering those wires into daisy chains. Here’s a daisy chain for one row… four more to go. I’m using clear LEDs which means you can’t tell what color they are when there’s no electricity running to them. 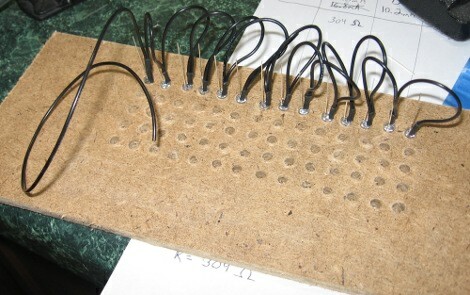 Before moving a row to the assembly jig I tested them on the breadboard. As I moved each LED from the breadboard to the jig I clipped off the excess cathode lead. From there remember the mantra: ‘Shrinktube FIRST!! !’ or you’ll be sorry. You can see it just above the solder joint in this image. Just keep going down the row until complete. In the image above I’ve already heated the shrink tube with a candle-lighter. Note: The two images above are different rows. For one I started on the left and for the other I started on the right. I hope it’s not too confusing. 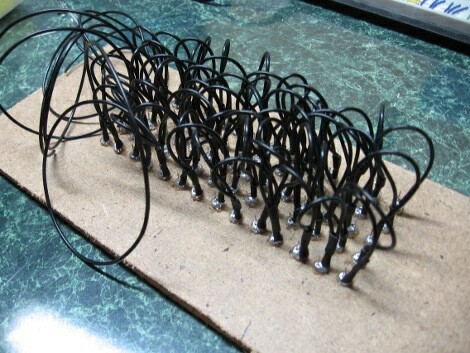 Here’s one row of completed soldering. After each I removed it and set it aside. All of the rows have been completed and I’ve reinstalled them in the jig in preparation for soldering the anodes into columns. 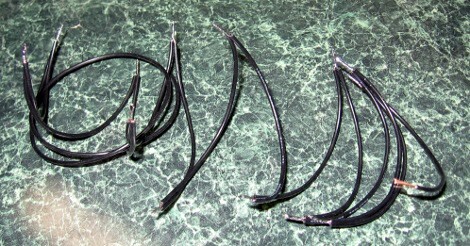 Here’s the wires cut to make daisy chains for the columns. 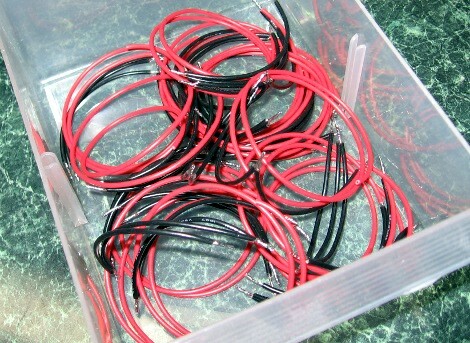 I used black wire for the short sections because I’ve got a huge supply of it compared to the red, which I’ve cut for the control lines. The completed column daisy chains. 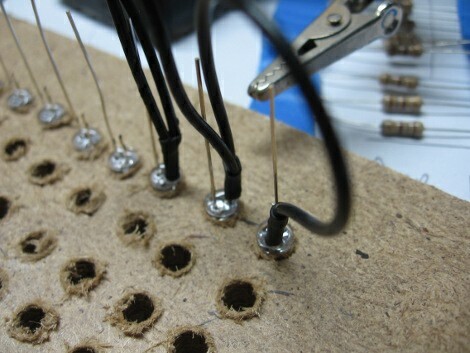 Here I’m soldering the fourth column. After I’ve finished one I just lifted up the five LEDs and held them aside with this third hand. Go slowly and be patient… you can do this! Done! Well, the LEDs are all soldered. It’s time to make a control board for the rows. Here’s the control board for my rows. I hot glued the incoming lines from the rows to the board for strain relief. Each is connected to the collector of a 2N3904 transistor. The camera flash makes it hard to see but there is a 3k3 resistor connected to the base of each transistor. 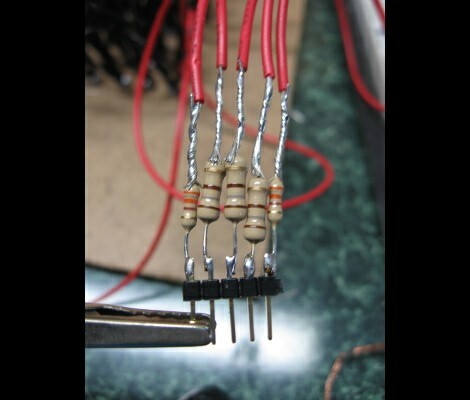 I’ll add single-conductor wire to those later so they can be plugged into the breadboard. On the left you can see a wire for the GND rail, which connects to the ground of the power supply. Each column contains the same color LED. I found that the red LEDs needed a different resistor from the rest. Here I’ve soldered resistors to the control wires for each column and soldered groups onto pin heads for each interface with the breadboard. Here’s the finished control board. 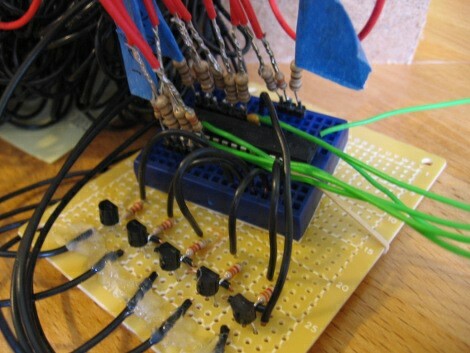 At the center of the breadboard is an ATmega168 microcontroller. The black arches connect the transistor base to PortC of the chip via the 3k3 resistors. 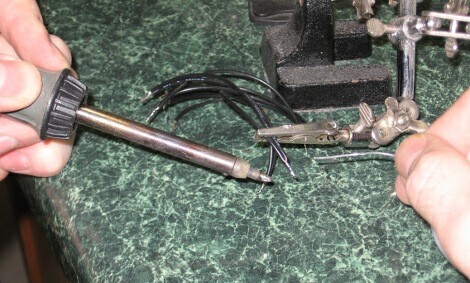 There are three groups of column pin headers that plug into PortB and PortD. This is an overview of the completed hardware. 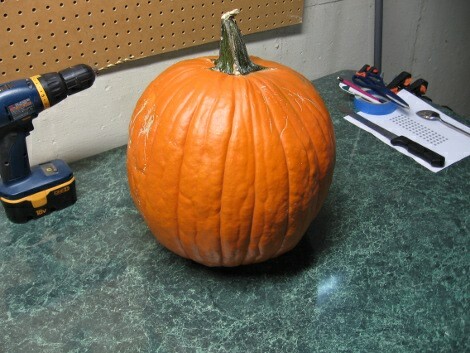 At this point I was sure hoping I’d be able to get this into the pumpkin. Here I’m working on the firmware for the matrix. This is where a better choice of material for the assembly jig would have been nice. But like I said before, it worked. 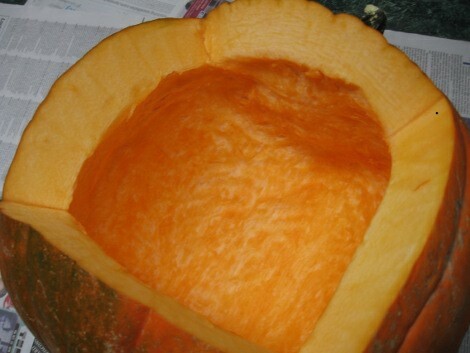 I started with a fairly large donor pumpkin. I tried to pick one that had a fairly flat face without too much curve. Before starting I made sure to locate where the matrix would be drilled by taping on another copy of the template I used for the assembly jig. I cut a large access hatch in the back and cleaned out the guts. The seams of this will not be seen from the front. Here it is, nice and clean. I want to keep as much wet gunk away from the electronics as possible. Time to drill. 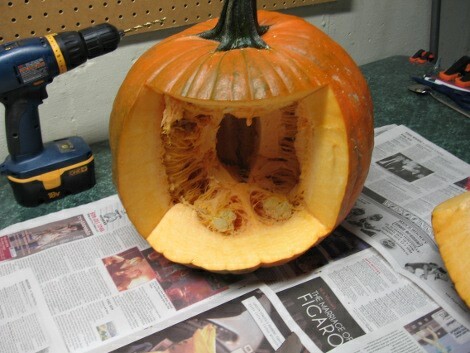 I used a bamboo shish-kebab skewer to poke a pilot hole through the skin of the pumpkin so the drill-bit wouldn’t wander. I found a 13/64th drill bit worked perfectly. Here’s where the LEDs need to go. I spent a bit of time making sure the holes were cleaned out using the skewers. 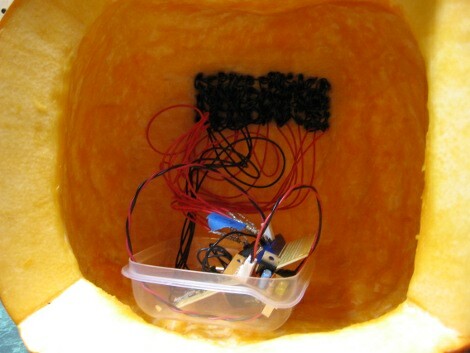 Take a deep breath and start inserting LEDs. Once I had them all in place I powered up the unit and checked to make sure I hadn’t switched around any of them. 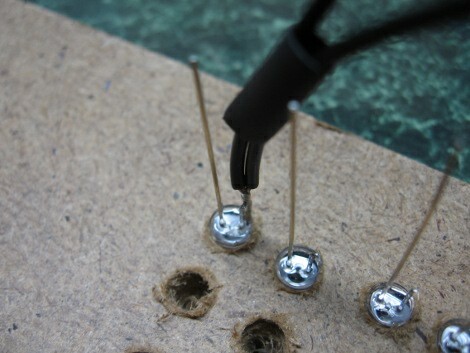 Once I knew it was right I used a skewer to push each LED through to the surface. This little plastic dish keeps the control circuitry dry on the bottom. I’ve added a little 5v regulator I built for a different project, with a 9V batter hidden beneath the larger board. The power is on and I’ve sealed the hatch using a few skewers. This is how it looks with the lights on. Here it’s displaying the work BOO. The finished product. Whew, what a relief! 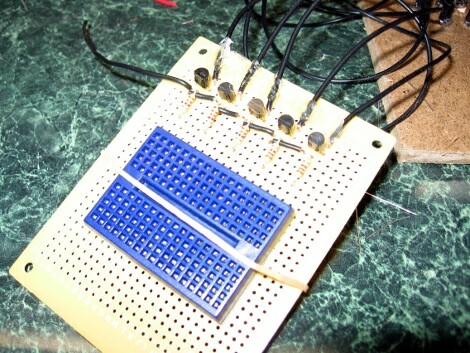 Ok, let’s jump into the why’s and how’s of building an LED matrix. The display I built has 70 LEDs. If you individually address each LED you’re going to need 70 pins on your microcontroller. But there’s an easier way. 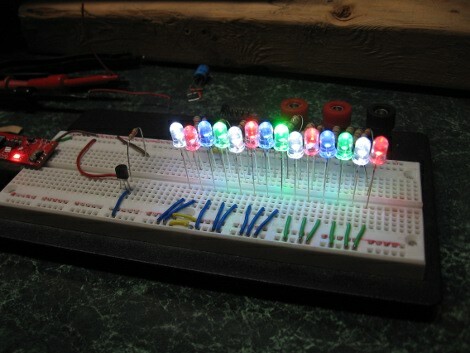 Multiplexing is a method of lighting just a portion of the display at one time. Using a microprocessor you can switch which section is on so quickly that your eye doesn’t ever perceive it being off. Because one section will be turned off while scanning through the other parts of the display you want to keep the number of multiplexed sections low. I chose to multiplex the five rows of this matrix. That means that one row will be on 1/5th of the time, which we call a 1/5th duty cycle. This is basically a type of pulse-width modulation, a technique we use to dim LEDs. I’ve used ultra-bright LEDs for this very reason. We want each LED to have the same brightness. Because only one row will ever be on at one time. 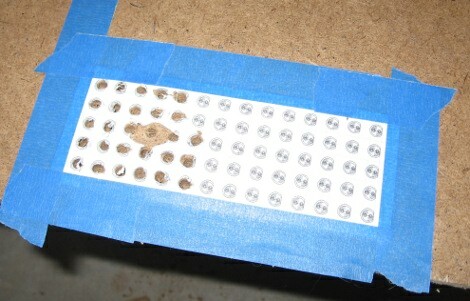 A single resistor in each column will work for all of the LEDs in that column. That is because an LED must be connected to both voltage and ground in order for current to flow. All of the Anodes (positive leg of the LED) are connected together in the columns, and all of the cathodes (negative leg of the LED) are connected in rows. So turning column 1 on and row 1 will let current flow through the LED at that location. The LEDs in rows 0, 2, 3, and 4 will not light because their rows haven’t been turned on and so they have no connection to ground on their cathode. In this way we build a grid of LEDs that are addressable. Multiplexing introduces an issue with current draw. I am limited in the number of columns I can drive because I’m connecting them to a microcontroller. If you look at the ATmega168 electrical characteristics in the datasheet you’ll find it can source 40mA per pin. But there is a limitation on what the supply pin of that chip (VCC) can source. The VCC pin is limited to 200mA. We must stay below that threshold or the chip may be damaged. This is part of the reason that I chose to use 14 columns. There will never be more than 14 LEDs on at once because that’s how many are in a single row. If I drive them at 10mA each, I’m pulling a total of 140mA. 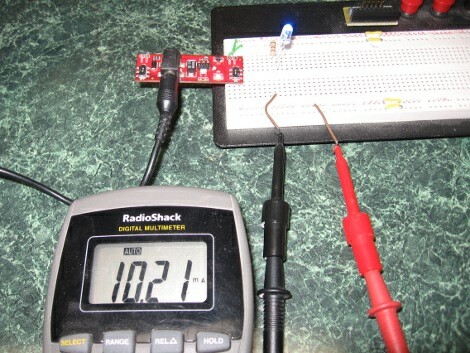 This is below the 200mA threshold and leaves some room for error, and for the current that the ATmega168 needs to run. I’ve also limited it to 14 because I wanted to reserve 2 particular pins on the device for other purposes, but more on that later. We need to consider the current on the low side of the LED matrix. The rows act as the ground connection for the display. If all the LEDs in a row are illuminated at once, there will be around 140mA coming down that control wire. It can’t be connected directly to a microcontroller because that’s too much current for one pin. Instead, I’ve used an NPN transistor. The 2N3904 conveniently has a 200mA limit which is enough to handle the 140 mA sinking from the display. These transistors work like a switch, requiring just 1/100th of the current you are switching to be present on the base leg of the device in order for it to connect the control wire to ground. How can we make bigger displays? I wanted to keep the parts count for this display small, but there’s really no limit on size if you’re willing to add more components. Beefier transistors allow you to switch much higher currents. 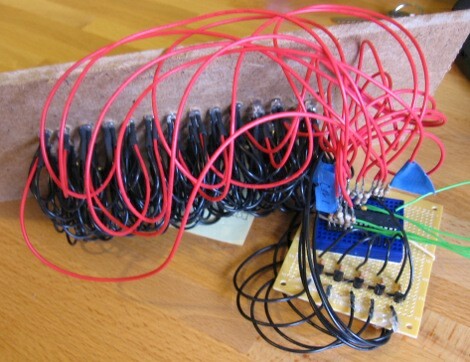 And you can use cascading shift registers to expand the number of columns. Those shift registers are addressed with one data line and a clock… pulsing data in serially instead of in parallel as we’re doing in our example. You take a speed hit because it takes two cycles for each column (one to set the data bit, one to clock it in, and repeat until all columns have been pulsed in). Explaining this in detail is beyond the scope of this tutorial but as long as you are keeping current consumption for your parts within the device specifications you can go big. 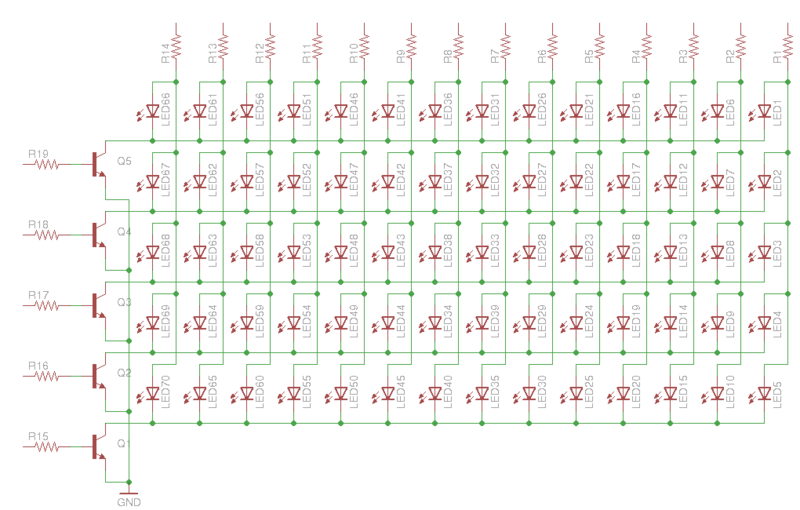 As I said above, I wanted to keep my parts count to a minimum and so chose not to use shift registers. That means I need one pin for each column and one pin for each row. Using all eight pins on PortB and PortD of the microcontroller I could still hook up the five rows to PortC AND have at least one pin left over (two pins if you want to use RST as I/O). Why didn’t I make this 16 columns long? There’s a good reason. I wanted to leave the serial port on the chip available for future use. RXD and TXD are located on pins 0 and 1 of PortD. I could have moved the last two columns to a different port but that would mean addressing 3 ports for the columns instead of two; causing a slowdown in the performance of the processor. Writing code for a multiplex display comes in two parts; some type of frame buffer, and code to handle the multiplexing in the background. Please download the source package and follow along. There are pin, port, and data direction register defines at the top that will clarify what some of the code examples in this post are doing. I’ve used hexadecimal instead of binary to instantiate this array. That’s a pretty common practice because it takes 1/4 of the characters to represent the same amount of data. Be assured, 0x0000 and 0b0000000000000000 equal the same value. Also notice that I’ve used the keyword ‘volatile’. This is extremely important, because this data will be accessed by both an interrupt service routine, and the main body of the code. If it is not volatile the compiler may optimize out changes to this code, resulting in bizarre and hard to debug behavior. Also, we’re using 16-bit data types on an 8-bit device. It will be important to disable interrupts when changing the data so that we don’t have an interrupt happen between changing the first and second bytes of an integer. More on this later. This is really one of the easiest parts of this process. It can just be a little hard to wrap your mind around what’s happening at first. 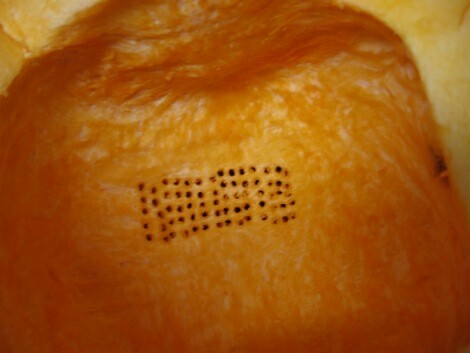 We don’t want to ever think about what’s happening with the scanning of our five rows. Using a timer-based interrupt we can multiplex the display at a constant rate and forget about it. Let’s consider the math for just a bit. 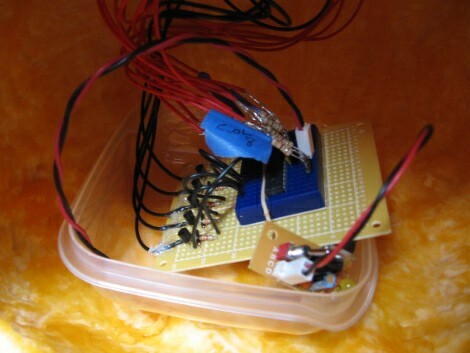 The ATmega168 has an internal clock that is set to run at 1 MHz. I’d like to have my display updated 500 times per second, resulting in a complete refresh 100 times per second. So 1,000,000 cycles per second divided by 500 interrupts equals a target of 2000 cycles. I need to set up a timer that will count each of the system clock cycles and trigger an interrupt when 2000 of them have passed. That is what I’m doing with the OCR1A value, 0x07D0 is the hexadecimal equivalent of 2000. For those of you who really know what you’re doing you’ve probably notice an error. The Timer starts counting at 0 instead of 1, which means I really should be interrupting at one cycle less that 0x07D0 but it’s close enough for jazz. I’ve defined ‘colPort1’ earlier in the source code as PORTD. That’s the one where we’ve reserved the lowest two bits for later use as a serial connection. When we write the integer data to a port only the lowest 8-bits will be read by the microcontroller because that’s the size of the ports. To the right of the equals sign I’m casting the integer data as an 8-bit char. We want the most significant byte of that integer data for columns 8-13, so we’re shifting the data to the right. But I only shifted it six spaces, because we’re not going to use the lower two bits of the register. Finally, I used the bitwise ‘&’ operator to mask out the lower two bits so that we don’t mess up any other uses for those pins that may come in the future. I feel this line of code is a great example of the power of binary data and if you don’t fully understand it you simply must take the time to study how this works. It’s a fantastic part of working with embedded systems. Our display is multiplexing in the background and we no longer have to worry about that. Now you can display just about anything you want by manipulating the frame buffer. In this case, the frame buffer is an array of five integer values. As I discussed earlier, when working with an 8-bit device it takes at least 2 cycles for it to write a 16-bit integer. What happens if an interrupt fires between those two cycles? For this reason it’s important to disable interrupts while changing the frame buffer. But disabling interrupts will stop our automated multiplexing so make sure you change the frame buffer quickly and enable interrupts as soon as you can. The above code is probably the simplest example we can use. This will immediately clear the display. The ‘cli();’ command will disable interrupts, and the ‘sei()’ command will enable them. In between I’ve used a ‘for’ loop to set all five integers in our buffer array to 0x0000, which represents off. If I had set them to 0x1111, all of the LEDs in the display would be illuminated. Explaining every part of the example code is beyond the scope of this tutorial. But take some time to figure out how it works. I’ve stored the font array and the messages in PROGMEM or I would have run out of ram. [Dean Camera] has a great tutorial on PROGMEM use which you should read if you haven’t used it before. As for everything else, play around and see what you can do! Nice writeup. I’ve been playing around with homemade 8×8 matrices for the past few days using a MAX7219. It takes care of the multiplexing for me, and all of the current limiting is done with just one resistor over the chip. I may have to finish a couple more 8x8s and fit them into a pumpkin now.. 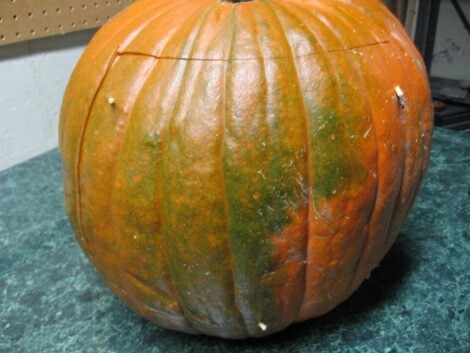 Forget the write up thats one cool pumpkin! If I had my tools and a place to put it (other than the hallway I share with 3 other apts. 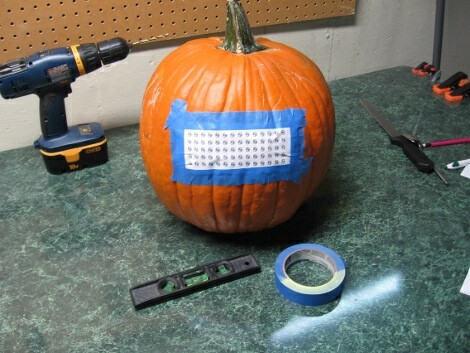 ), I’d build me a Cylon Pumpkin. By your command. 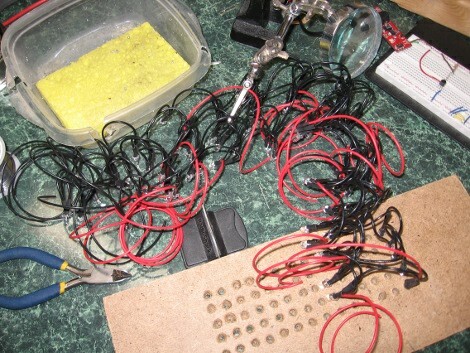 I read hackaday every day and rarely reply but this is how a “how to” is done! Explaining choices behind design decisions, using enough depth to convey your point without going off topic too deeply, and yet leaving a little thinking to the reader. I commend you sir. 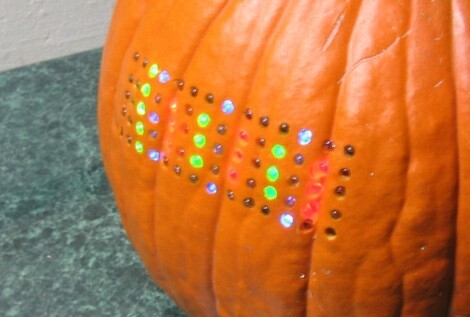 Also this is way sweeter than the mini pumpkins we flashed with 555s when I was younger. Eww yuck, a Radioshack multimeter. very cool!….a lot of effort was put in, good job! 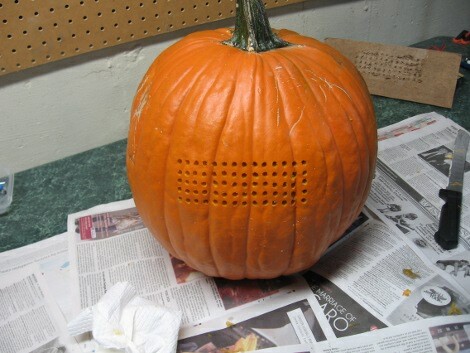 Pretty awesome, but lets make it look like a pumpkin! Make it look like it has some eyes with the leds… And mabe make them blink or look from side to side or up and down.. That would be super cool… Time to add a mouth also…. 2TheAstrogator: Yeah… maybe someday I’ll get my hands on a better multimeter but for now this one works. 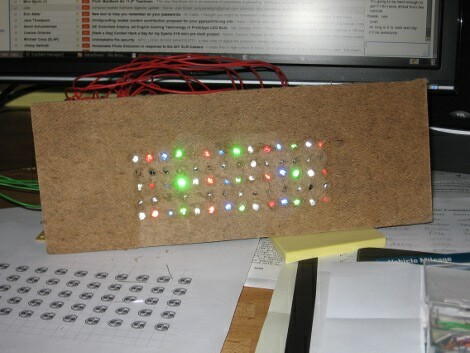 @Prankster: You’re right, if I had more time I would have added a row of LEDs for a mouth and a circle for a smile. But there’s always next year. really nice article. photos at every step and clear writeup. Say what you want about a man’s tools, but at the end of the day it’s what gets built that tells the tale. I’ve seen dudes with massively cool setups sitting on their thumbs and guys with nothing scratching together magic and miracles. I noticed that your post contained incorrect sample code when configuring the timer interrupts. I only recently learned what those lines of code actually do with the internal timer and the Atmega168 registry, hence I noticed. Either way, I thank you for a nice tutorial on organic matrix arrays! Now do it with OLEDS (or better yet, pickles)! Your post is quite clear and easy-understood. Great. Happy Halloween day! hey this is so cool..! btw, this is what we had to do for our project sans the pumpkin of course. We had to display our name with 6×12 LED matrix. Anyway, can I link your site? While you’re obviously right when you say “Be assured, 0×0000 and 0b0000000000000000 equal the same value,” it’s clear that 0x1111 != 0b1111111111111111. Hexadecimal is easy to convert to binary since each hexadecimal digit can be converted directly to a nibble, a block of 4 bits. The correct statement is that 0x1111 = 0b 0001 0001 0001 0001. Always remember that decimal, hex, binary, or any other base is just a convention allowing representation of any real number or integer using a finite set of symbols. It is often helpful to think of a number’s representation written in a given base as the sum of the products of its digit values with the implied base power for each digit. That is, 0x1111 = 1 * 16**3 + 1 * 16**2 + 1 * 16**1 + 1 * 16**0. Hi, i was wondering if there was a schematic of how the pins are connected from the micro controller to the LED matrix? it’s been long time i’m just collect information about any thing. are you made rgb matrix led monitor ?